The 68th (EICMA) Milan Motorcycle Show, Nov. 2 to 7 will feature the unveiling of the new Ducati 1200 super street model, “Diavel” and eight new models by Honda. It will also feature a new Custom City, dedicated entirely to custom bikes. Hosted in the trade fair district of Fiera Milano Rhò in Milan, Italy, the EICMA draws 400,000 to 500,000 visitors. It is the largest bike show in the world. More than 2,300 journalists from 31 countries attended the 2009 EICMA. CUSTOM CITY is being introduced at the 2010 Milan Motorcycle Show as a “show within the show”, in the same way that “Green Planet” was introduced last year for hybrid and electric vehicles. The idea matured thanks to the insistence of motorbike companies, manufacturers and enthusiasts, but finds its rational justification in numbers: against current downhill market trends, the share of vehicles dedicated to custom and touring bikes has slowly grown to represent 17.5% of the sales market. CUSTOM CITY will be set up in Hall 2 of Fiera Milano, in collaboration with Terre di Moto srl, which will notably be putting on a show, and is fully sponsored by Biker's Life Motorcycle Magazine. 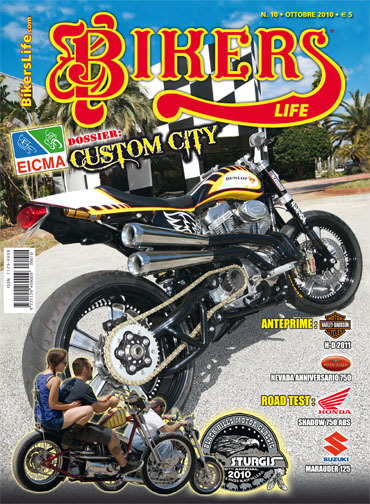 Biker's Life also supports the Italian Padova Bike Expo, and flies the top three winners and their bikes to compete each year at the Rat's Hole Custom Bike Show during Daytona Bikeweek. Bike builders from all over eastern and western Europe compete in the Padova Show in January for a large purse and prizes that include flights to compete in March during the Daytona Bikeweek rally that draws half a million bike enthusiasts worldwide. So it will be interesting to see what may develop from this sponsorship. The opening trade-show days (for press and industry) are Nov. 2 & 3, 2010. In recent years, MotoLive has been introduced and has become a "must see" event at the massive expo. In the brand new American Pavilion, seven new electric models by Brammo will be presented. The Scootergirls from Los Angeles made their fashion debut last year in the city known for fashion and they will be back to preview a colletion for men. The company speciaizes in protetive motorcycle garments with high fashion appeal. UPDATE: Here's footage of the 2011 Ducati Diavel super street bike unveiled at the EICMA Show. In some ways, the stripped-down machine recalls the original Ducati Monster 900, a lightweight bike, elegant in its simplicity, that essentially saved the company nearly two decades ago. The Diavel features a superbike-derived Testastretta 11° engine and 456lb of authentic Ducati performance, including ABS, Ducati Traction Control and Ducati Riding Modes. The new motorcycle is sure to excite longtime Ducati fans, especially those who long for the form-follows-function approach the company took to bike design in the 1970s and 1980s. Unlike many bikes nowadays, the Diavel looks more like a horse and less like a two-wheeled car, but it is also loaded with modern performance and safety features. While it has some of the dirt-tracker looks of a Harley-Davidson XR1200, it also resembles the recent wave of high-tech musclebikes from the Yamaha V-Rod and the BMW K 1200 R. The new Ducati, which is scheduled to go on sale in late winter or early spring of 2011, uses the same Testastretta engine used in the company’s top-of-the-line superbikes. The Diavel will also offer anti-lock brakes, traction control, and electronically adjustable riding modes aimed at increasing safety and comfort. Harley Davidson will present the new SuperLow, together with four new CVO models. Yamaha will present an electric scooter, a city mobility prototype. Italian visitors will also have the opportunity to view the new ZX-10R, the Z750R by Kawasaki due to be launched on the market at the same time. KTM will present the Duke 125 in its naked version. Aprilia presents two 4-cylinder models: Tuono 1000 and RSV4 with traction and wheelie control, as well as the Dorsoduro 1200. And BMW presents two Touring motorcycles: a 6-cylinder K 1600 GT and K 1600 GLT. At Triumph all eyes will be on the official presentation of the new Tiger 800 enduro with 3-cylinder engine. Piaggio presents a comeback of the Vespa Classica (the PX 125 with handlebar gear lever) and the Piaggio Typhoon. The novelty at Moto Guzzi will be the V7 Racer. And the helmet manufacturer, Kali, will be presenting its ROAD Line series for the first time ever.